Kids tend to fall down a lot. When they do, they usually get up, dust themselves off, and keep going, no worse for wear. Senior citizens also fall down a lot. But when they do, it can be a lot more serious. The Centers for Disease Control and Prevention (CDC) reports 2.8 million older people are treated in U.S. emergency departments each year for fall-related injuries. These falls are often serious. The CDC says 800,000 people who fall are admitted to a hospital for treatment. 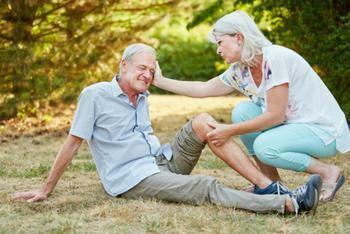 Falls are the most common cause of traumatic brain injury. Researchers, trying to figure out who is most at risk of falling, say brain activity may yield a clue. “In older people who had no signs of disease that would make them prone to falls, higher levels of activity in the front of the brain, called the prefrontal cortex, were associated with a higher risk of falls later in life,” said study author Joe Verghese, of the Albert Einstein College of Medicine in the Bronx, NY. The main takeaway from this finding, he suggests, is these people were increasing their use of brain cells or using different parts of the brain to compensate for subtle changes in brain functioning. A study of 166 healthy seniors found that when there were higher levels of brain activity while both walking and talking, the person was more likely to take a spill. The study also found that with every small increase of brain activity, there was a significantly greater risk of a fall. “These findings suggest that there may be changes in brain activity before physical symptoms like unusual gait appear in people who are more prone to falls later,” said Verghese. Verghese says there needs to be more research done to look more closely at the link between brain and nerve diseases associated with falls. Previous research has identified other things that can contribute to falls. The CDC has pointed to lower body weakness, vitamin D deficiency, medications that promote dizziness, and even vision problems. The CDC says most falls are the result of a combination of risk factors, with the more risk factors increasing the likelihood of falling. Should seniors delay getting a flu shot?